Rockario: Who needsd emotes now? SuperSugarSloth: time to make meat with our mouths? chaostreader: Hi chat. Hi Ian and Heather. thirsty_kitteh: Try to remember (premember) being Good Enough? SydPreviouslyHeadache: my perception of time is so fucked, it feels like it wasn't *That* long ago that we played this. like maybe 6 months? Travilogue: Yeah, it is made for a guitar controller. ArcOfTheConclave: Didn't you play this game already? Ignatiuspants: is this ... the backwards shoot-em-up that works as a rhythm game where you have to catch the bullets that you presumably shot? Ignatiuspants: ooh ... it is! MrLephisto subscribed with Twitch Prime. They've subscribed for 9 months! Travilogue: Although, iirc, the developer did build in support for a *wide* variety of controllers, including dance pads and some legacy console controllers. GDwarf subscribed at Tier 1. They've subscribed for 59 months! GDwarf: Oh, now I remember this game! 126 raiders from Bengineering have joined! Talanvore subscribed with Twitch Prime. They've subscribed for 28 months! CommiePuddin subscribed at Tier 1. They've subscribed for 58 months! BloodnBullets subscribed at Tier 1. They've subscribed for 19 months, currently on a 19 month streak! BloodnBullets: what word heather? Plaid Posse? thirsty_kitteh: what if we ask nicely? aitsu100: up up down down left right a b? Travilogue: Or yeah, just use up and down to select your lane. killerofgiants subscribed with Twitch Prime. Travilogue: I think you might have put stick down to lane 5? Amentur subscribed at Tier 1. They've subscribed for 7 months! OmnipotentTrevor: You can also use the powerup that gives you more points temporarily right? Is that the "overthrusters" you're getting? GDwarf: I don't actually remember how this ends, but if we're reversing time is the final screen us realizing that we have to fight through this entire armada again, because now they exist once more? chickenace11: Wait did something n the screen just say space time healed? GDwarf: The wild thing is that DF has always used graphical tilesets...it's just that the default one uses *pictures of letters* rather than other images. Unpronounceable: Isn't DF more or less the best game for emergent stories? SquareDotCube: No soliders or anything, they were all civilians. chickenace11: I wonder if this game came about because somebody complained about how all rhythm games were easy so the developer said " Ha watch this "
SquareDotCube: The octagonal port of the Gamecube controller was a great idea and I wish it wasn't scrapped. SquareDotCube: Also yeah, games are starting to have their own controller APIs to recognize different inputs. CaptainSpam: I still like the Steam Controller. Shame it didn't get much love from devs. OriginalGarwulf: Anybody else in their late 30s/early 40s reminded of Cosmic Avenger on ColecoVision? SquareDotCube: maybe a mid-2000s hackerspace, before it got popular. OmnipotentTrevor: Unrelated question, anyone know if we're getting a countdown to infinity podcast for Captain Marvel? GDwarf: "Do you know where Web Surfers hang out?" TheMandrew: get in the blagole! OriginalGarwulf: LRR: Quick question for Ian, from a fellow hat wearer: what was the hat you were wearing in the egg drop last night? (MIne's a Stetson Snowden). Invitare: Ian's wearing a hat? SuperSugarSloth: The meat method of egg security was amazing. TehAmelie: i missed the start, is there any reason we're flying backwards? OriginalGarwulf: I could tell it was fur felt from the brim. kat2kool: @tehamelie we're undoing time! Variab1e subscribed at Tier 1. They've subscribed for 63 months! OriginalGarwulf: When I went shopping for my Stetson, I actually came the realization that I wasn't comfortable with a fur felt, so I went with crushable wool. OriginalGarwulf: It's an outdoor hat, so lots of water resistance. And I got it for about $15 from the Stetson outlet store. Hingadora: @OriginalGarwulf Just coming in here, but yeah. The hard felt is surprisingly odd. OriginalGarwulf: Soft felt is very nice. MintChocDoublin: ian not wearing green? did anyone pinch him yet? Unpronounceable: If a hat is a shield, then what are sunglasses? Hingadora: I wear a Stetson because bright and because rain. ContingentCat: I like the idea of hats but they just aren't me. Also the combination of big head and thick hair makes hats difficult. OriginalGarwulf: For fall and spring I've got the Stetson, and for the summer I have a Tilly hemp. GDwarf: What is a hat if not sunglasses for the rest of your head? Rockario: Does anybody remember what the deal is with the enemy bullets with the swirling effect? e_bloc: I bet you do Ian. Oriion_: I wear diapers for the same reason, Not today! FITorion: I wear hats when I go to crowded places like CONs or Disneyland. as a sort of vissual marker for me in a crowd. Blasteg: is it me, or the screen is way more busy than it need to be? Rockario: Okay, they're power-downs in addition to just taking a hit. SFSMaus: Keep in mind, chat, that the LRR playmat has the caricature of Heather wearing her hat. RealGamerCow: Is this the backwards music game again? OriginalGarwulf: The trick to looking good in a hat is to just treat it like regular clothing. And like wearing it (that's important too). SquareDotCube: I wonder, what if a beret? RealGamerCow: Heather will remember this. e_bloc: writes down "Ian is gullible"
TehAmelie: looking at the score, there's tens of billions of points we've already lost. are those from higher difficulty levels or something? WhaDidBeejPutInDPie: do those evil bunny ears count as a hat? that's my favorite hat. OriginalGarwulf: Also, it does help to wear hats that are suitable for the weather. I wear an "outdoor hat" because when I'm out and about, I'm trying to keep my head clear of the sun and inclement weather. A hat that couldn't handle wind and rain would not last long. DarkMorford: Everyone should have a GPG keypair. We need to get that web of trust going. GDwarf: I want to know how we beat this thing going forwards in time, because it only telegraphs its attacks when played in reverse. emonotony: More rhythm, more rhyme? FITorion: what was the answer on ANOANI? DarkMorford: FITorion: Keeping it in the back of the mind, but nothing to announce yet. DarkMorford: Ignatiuspants, you mean a beginning. emonotony: Turns out a doctor will stab you in the foot to get to a disease in there. Ignatiuspants: I hope you make a full recovery soon! emonotony: It was the tiniest of amputations. Ignatiuspants: ooh, an amputation? that's even worse than being stabbed! LRRbot: The stream has been live for 1:05:45.
emonotony: Ignatiuspants Well they cut into my foot to remove a broken bit and replace it with nothing, so, yes, technically. VDel_234: just got here, is the stream over? emonotony: Wound will heal when it heals and I'll be fine then. emonotony: Ignatiuspants As it turns out, you can live without a large number, as I've found out the past week! GDwarf: "You won, now give us stuff!" ? Tiber727: That's odd. I see tons of cherry pickers on the internet. You'd think the high supply would bring down the wages. FITorion: yeah my Mom has a row of rasberrys in her garden. GDwarf: Rapberries are "canes", I think? GDwarf: Which would be...not a tree, but very similar? I think? wordmogul: Raspberries can be very very invasive. emonotony: My granma had a raspberry garden left unattended for about five years. Tiber727: Part of me wants to plant some berry trees, but I'd have to put a fence around it because deer would eat it. FITorion: rasberries vines are like a less Intense Black berry vine. FITorion: smaller thorns... and generally less wild. Juliamon: Our place in Vermont had both raspberries and blackberries when I was young. By the time we sold the property it was pretty much all blackberries. TheBearBee: Is this the backwards time shooter rhythm game? Juliamon: I loved out pussywillow tree until dad trimmed it wrong, now it only blossoms at the top (above roof level). Tiber727: @Myrdin90 I can only imagine the current Ian's head scaled down and put on a child's body. GDwarf: "Got to meet Ralph Klein", so more of a punishment, then? wordmogul: The stone path is a good idea. Nothing’s bloomed up so far, but we’re still getting out of winter here. GDwarf: I've also noticed that the earlier in time we go, the tougher the enemies were. So they lead with their strongest machines, which...makes sense, really. SquareDotCube: I lived near some woods. It had a pawpaw. emonotony: GDwarf Prove he doesn't. RealGamerCow: wait, gooseberries don't have husks. At least not the ones I grow. niccus: time for highest difficulty! SquareDotCube: Turns out the credits were the enemies all along! LRRbot: The stream has been live for 1:21:31.
e_bloc: oh the Tinkler could stay but Brandon Dicks had to die? GDwarf: The Tinkler? Kirby made this? Blasteg: so the game is uh.. whtever fighting those machine suddenly cease to exist, so you have to make sure those attacks happen? emonotony: Is the Ian okay? Unpronounceable: What about the missiles? emonotony: Ichiro too, for his patch garbo. Fruan: Buh! Time for Buh? WhaDidBeejPutInDPie: all the animal frands! Amentur: Is this the parade in paprika? kat2kool: What game is this? emonotony: I've got a stand that stops time. kat2kool: Neat! I'm going to check it out! ConspicuousCompiler: Is it Tuesday already? emonotony: Ian, now: "That was harder than I expected... which is great!" Aenir798: I left earlier during the first game, what on earth did I come bac to? kenkopin: Well, there IS a giant animal parade going on. GDwarf: Aenir798 It's a parade. 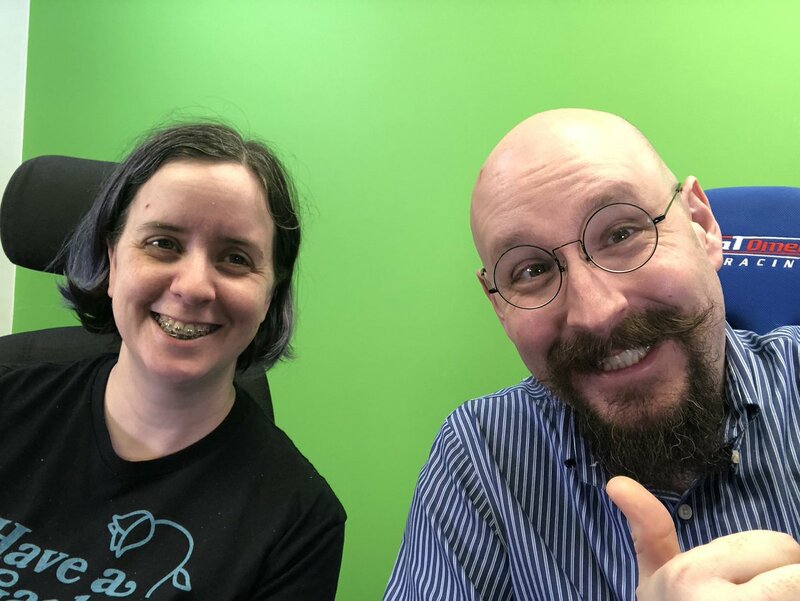 Tempest2097: Hallo Ian and Heather! Alness49: Let's ROTATE THE PARADE! RealGamerCow: What is the original language of this game? emonotony: Tempest2097 That's not necessarily true, you could, say, eat apples directly from the tree. Tempest2097: I'm not like "Oh man, lemme just get a nice raft of bacteria down in the morning"
emonotony: Tempest2097 How about fungi? WhaDidBeejPutInDPie: @Tempest2097 bacteria is delicious! Tempest2097: @emonotony Fungi are usually cooked first. emonotony: What about seeds with sprouts? TheInnsanity: is it an OTP if it's in the game? Tempest2097: I don't eat sprouts. emonotony: What about going full Ozzy Osbourne? CaptainSpam: This IS why people hold parades, right? To escape the flying saucers trying to abduct them? Tempest2097: Definitely not drugs, and most CERTAINLY not by bat. Tempest2097: That's how you get Bat Viruses. emonotony: Well we've established food can still be alive. 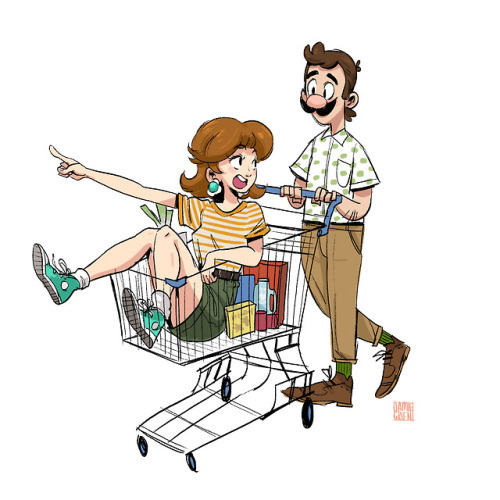 emonotony: Didn't Odyssey establish Peach and Mario aren't a thing? Tempest2097: I mean, I feel like if you're eating your food alive, it's needlessly cruel. CaptainSpam: A "normal" life besides Luigi being dragged into hunting ghosts every so often. GDwarf: emonotony Well, that Peach isn't ready to marry, especially under ridiculous pressure. Not quite the same as "not a thing"
emonotony: GDwarf Listen my headcannon is Tiara x Peach and Mario x Bowser. Rockario: Mario might be more like a person who has lots of uniforms, and is like "Why would I buy other clothes, when these uniforms are free?" GDwarf: It's fun to watch Luigi's personality change over time. Sarah_Serinde: Hullo friends, how goes? Tempest2097: It's my Birtdhay!one one exclamation point one. MaladyDark: I actually really like the outfit parts of odyssey. and then settign it to random is just great silly fun. Sarah_Serinde: WhaDidBeejPutInDPie Is it? Oh good. Sometimes I worry. emonotony: Tempest2097 Is that !11!1 or !1!1? WhaDidBeejPutInDPie: @Sarah_Serinde your name is fun to say. i think its the alliteration. Tempest2097: @emonotony The second one. Laserbeaks_Fury: Does DK ever show up? Tempest2097: Neo New Donk City. SquareDotCube: I gotta beat Breath of the Wild before I decide to start on Odyssey, though. Laserbeaks_Fury: Why, this picante sauce was made in New Donk City! CaptainSpam: It's the super-spaztic camera that's making this not really be my jam. FITorion: anything currently in anime you love? RealGamerCow: Did I hear sumo anime? DarkMorford: I'm enjoying Girly Air Force and Quintessential Quintuplets. Rockario: I'm going to have to catch Fruit's Basket, because I mised it the first time around. SydPreviouslyHeadache: Zoids is getting another anime! DarkMorford: I don't think I'll be able to enjoy the remake of Fruits Basket. They didn't bring Horie Yui back as Tohru's voice actress, and that's just plain wrong. GDwarf: I only ever saw a few eps of Fruits Basket in anime club, wasn't for me at the time, but my tastes have definitely changed since then. Rockario: I just want to watch it for the "people who are also animals"
Rockario: Anyone else remember the fan-made radio-drama version? MaladyDark: can we get toast girl thouh? Sarah_Serinde: It's been ages since I kept up with any anime or manga. I should get back into it, but...what is time? neacon subscribed with Twitch Prime. They've subscribed for 28 months! Scar_Red_Tiger: I've been picking up more manga after the anime than I used to. Social influence helped. DarkMorford: I have at least two manga that I intend to start reading after their shows this season end. TheInnsanity: Heather has inherited a Beej noise? Tempest2097: Humans are surprisingly good at mimicking noises. CleeKru subscribed with Twitch Prime. They've subscribed for 19 months, currently on a 19 month streak! GDwarf: I don't usually watch anime as it airs, but I might for Sarazanmai. I dunno. I'm...really nervous because I want it to be good, but I worry. Tempest2097: It probably helped us hunt prey or something? Veketshian: Do you think Ian's brain is formatted in FAT32? MaladyDark: bye bye... this time next week I'm going to be in canada! wordmogul: Thanks, Heather and Ian! NeverTrustin: We are going to C2E2 Also!!! TehAmelie: like, they'd have bad rhythm mechanics? but still be good and fun to play?